The first step in going organic is to stop using the toxic chemical products - fertilizers and pesticides. 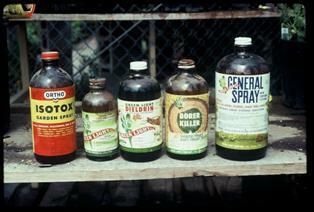 This is an actual photo of a group of pesticides that a listener brought into an organic nursery asking for help. I suggested that the manufacturers should take them back. The companies declined - they didn’t want DDT, Chordane, Dieldrin either - even though they made this garbage in the first place. There's a new feature on DirtDoctor.com, click on NPoison of the Week . The last few weeks our radio discussions were on Sevin, 2,4-D and Malathion. We're telling why technically they are so bad, and of course the organic alternatives are already on the website. Each week learn about another toxic chemical. The chemical pushers continue to try to convince us that they are safe! Of course, they aren't.